Guru Nanak was known to be the founder as well as the first Guru of the Sikh religion. Guru Nanak was born in the simple Hindu family in the western Punjab village named Talwandi. From very early age he was very interested in knowing the meaning of life and religious psychology. As the young man he used to spend his day with the meditation and the history of religious teachings with the Muslims and Hindu religious persons. When he was 16 he has married to Sulakhani and also had two offspring Sri Chand and Lakshmi Chand. He has also worked as accountant in the stores of the Daulat Khan Lodi, the governor of Sultanpur. In the morning Guru Nanak Singh used to work and in the late nights he used to meditate and also sing hymns. These sessions has attracted many people and has also started to join the two other singers. At the age of 30 Guru Nanak has went to river Vayee for bath and has not returned back and he's feared that he has drowned. After three days Guru Nanak has appeared from the same spot from he has disappeared but after that he was not the same person as he has got the divine lights in his eyes and his face was having resplendent. 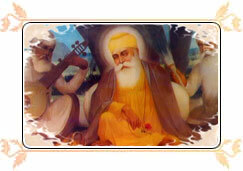 It has been believed that Lord God has enlightented him as the Guru Nanak Dev. He traveled everywhere in the Indian subcontinent as well as the places from abroad like Makkah, Medina and Baghdad. Throughout the world he has preached the universal love and oneness of divinity. Offspring: Four Sahibzadas- Baba Ajit Singh Ji, Baba Jujhar Singh Ji, Baba Zoravar Singh Ji, Baba Fateh Singh Ji. Death: October 7th 1708, Near Nander on the bank of Godavari. Guru Govind Singh Ji was the tenth and the last Guru of the Sikhs who has invented the Khalsa Panth and also preached learning through religious books. Guru Govind Singh was the great warrior and a wonderful scholar and also one of the important religious personalities of India. He fought with the words and only used his sword to fight the injustice and tyranny. The Sikhs pays him tribute by saying 'Sawa lakh se ek ladoon. Tabhi Guru Govind Singh Naam Kahaon'. Khwaja Moinuddin Chisti (1143- 1223 AD) was one of the most popular Sufi saints in India. Khwaja Chisti was born in Sanjar in Iran. Khwaja Moiuddin Chisti reached India in around 1192 AD after the death of Prithvi Raj Chauhan. 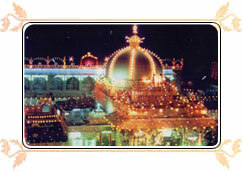 Just after staying here for the short period of time in Lahore and Delhi he has reached Ajmer in 1195 AD and has established his place of worship and also started to spread his universal love and brotherhood. After his death on March 11th 1223 AD his devotees started to pay homage and also holds conglomeration from first to sixth day of the Islamic month of Rajab every year. Sai Baba of Shirdi is also known as the Shirdi Sai Baba, who was earlier known as the famous spiritual guru India and also a yogi and is also regarded as the followers as an incarnation of god. Some of the Hindu devotees believes that he was the incarnation of Shiva and is also believed that he was Sadguru. There are many such miracles that has been performed by Sai Baba of Shirdi. The moral code of Sai Baba is the love, forgiveness, helping others, charity, contentment, inner peace, devotion to god and guru. Sai Baba is the popular saint who is worshiped around the world. There's always a debate among the people regarding the Hindu and Muslim origin that takes place. Sai Baba od Shirdi was having no such discipline and he did not even allow to provide the formal initiation. After the death of Sai Baba the devotees only offered the daily Aarti. Meerabai was an aristocratic Hindu singer and also the great devotee of Krishna from Rajasthan. She was born in early 16th century and was belonged from the royal family of Mewar. At the age of 13 she has been married to Bhojraj but her marriage lasted till three years as her husband Bhojraj was wounded in the battle. Immediately after the death of her husband she became the victim of her in laws. She has composed many devotional songs to praise Lord Krishna which are still sung till now throughout the country. She ultimately died at the feet of Lord Krishna in Dwarika at the age of 67.